With its easy dis-assembly and excellent maneuverability the Cooper 3-Wheel scooter from Shoprider is the portable scooter for you. Exceptionally simple to transport, the Cooper scooter disassembles into five light weight components and its compact components will fit in even the smallest automobiles. The Cooper scooter also has superior maneuverability through narrow hallways and aisles. 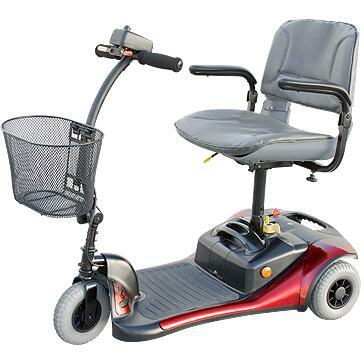 Included accessories with the Cooper scooter are solid no-flat tires, a comfortable swivel seat with arms, and a basket all at no additional charge. Maximum Incline Rating: 6 deg.